Since the early 1990s, Cuba has suffered debilitating blows that resulted from the demise of the Soviet Union and the disappearance of the economic and financial system in which the island was inserted (Council for Mutual Economic Assistance, or CMEA). The termination of traditional trade partnerships with the Soviet Bloc and the loss of the favorable and stable terms under which most of its trade took place left Cuba without markets for its traditional exports (mainly sugar, tobacco, and nickel) and drastically reduced its import capacity (in particular oil). With the real GDP plummeting by more than 40% between 1990 and 1993, Cuban authorities were forced to develop a strategy of reinsertion into the global economy aimed at seeking new markets, sources of financing, and technology. President Fidel Castro and other senior officials have never concealed their intention to keep foreign ownership and capital in the communist island at a minimum level. They keep saying that foreign investment is a complementary measure aimed at strengthening and improving the country’s state-run socialist system, not destroy it. Nevertheless, an increasing number of foreign firms have entered the Cuban market since 1993, mostly attracted by the opportunity to get a foothold in the Cuban economy before the lifting of the embargo, take advantage of the lack of U.S. competition, and make good levels of profit in a country that has set a brand new business and economic path. What begun as investments in a handful of hotel and oil exploration joint ventures in the early 1990s has grown into a significant and varied presence in almost all sectors of the Cuban economy, from mining and tourism to financial services, manufacturing, construction, food processing and agriculture. While it cannot be argued that foreign investment plays a fundamental role in the Cuban economy, it appears evident that foreign capital has helped Cuba to increase production of oil and generation of electricity, find new markets for its main exports (apart from sugar) such as nickel and tobacco, and boost international tourism from Canada and the countries of the European Union. Joint ventures for the construction and exploitation of new hotels in the island and management expertise provided through administration contracts have transformed tourism, at least in gross terms, as the country’s biggest generator of foreign exchange. Any attempt to carry out a comprehensive analysis of foreign investment in Cuba is hindered by the lack of reliable and detailed information on the activities of foreign firms and their contribution in terms of capital. Due to what Cubans call the “U.S. economic blockade” against the island, public disclosure of data on the presence of foreign capital in Cuba is practically limited to statistics on the number of international economic associations (Asociaciones Económicas con Capital Extranjero, or AECEs)4 by year, by sector, and by country. This method of reporting the level of foreign investment in the country offers no information on the value or strategic importance of the deals involved. Nevertheless, this paper utilizes the best available information from a variety of sources (some of them confidential) in order to provide a detailed overview of foreign business activities in Cuba, with a particular attention on recent developments and new strategies implemented by the Cuban government. It begins with an analysis of the evolution of foreign direct investment (FDI) in the island and the main results of international economic associations in 2001 (a few AECEs signed in the first half of 2002 and expansion plans of existing investors are also reported). It continues with an examination of new forms of investment that have assumed growing importance in the last few years, such as cooperative production agreements with overseas firms. Finally, it uses some indicators of AECEs and other accessible data to give a sense of what foreign investment represents to the Cuban economy. The opening to foreign investment and international tourism, matched by increasing interest but also growing complaints from foreign companies, led the government to draw up updated and more attractive legislation in 1995. Law 77 of 1995, while repeating some of the basic aspects of the Decree Law 50 of 1982, set out specific guarantees for foreign firms by establishing full protection and security against expropriation and opened all sectors of the Cuban economy (except public health, education services, and armed forces) to foreign investment. It also abolished the limit of 49% of foreign shares for joint ventures and authorized for the first time the possibility of 100% wholly foreign owned investments. Finally, in an attempt to speed up and streamline the approval process of new agreements, the law required the approval or denial of an investment within 60 days of the presentation of the formal request. After 1993, Cuba intensified the promotion of foreign investment. Through visits to foreign countries, participation in international investment events, and meetings with potential investors, Cuban officials have been very active in publicizing the advantages of business activities in the island.6 As a result, the number of international economic associations has grown steadily and expanded to different sectors of the Cuban economy such as mining, construction, light and food industry, agriculture, and services. What’s more important, small joint ventures with relatively low amount of foreign capital invested gave way, to some degree, to larger associations (such as joint ventures with Canada’s Sherritt International in the nickel sector and Italy’s STET in telecommunications) with large foreign capital investments as well as new and more modern operations. An important change of policy toward foreign investment occurred in 1998 when the Cuban authorities declared their preference for economic associations that involved higher amounts of capital and loan financing. In fact, as a result of banking reforms and continued economic recovery, Vice President Carlos Lage announced that year the intention of the government to pursue a strategy of encouraging foreign investment in large development projects while limiting investments in smaller projects, unless they included the introduction of new technologies or new export markets. He added that Cuba’s governmentoperated banks were in a position to provide small amounts of capital.7 For instance, in 2000, direct investment agreements mainly included large projects in oil, energy, construction, and telecommunications, for which Cuba was unable to provide financing. 8 The government has also continued to promote joint ventures in the tourist sector for the construction of hotels and resorts for international tourism. 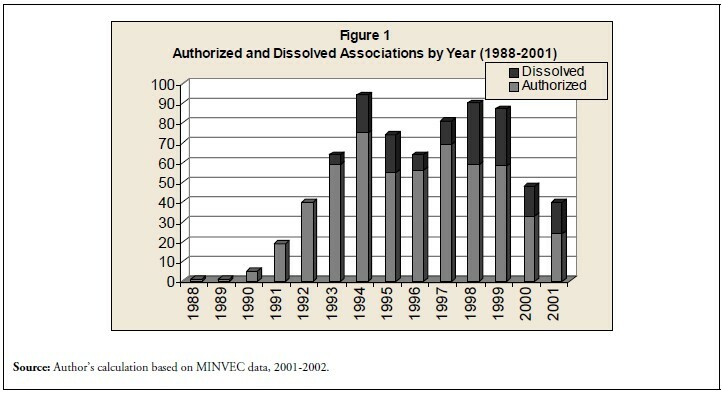 Cuba’s increased selectivity on foreign investment is demonstrated by data on authorized and dissolved international economic associations (Figure 1). Between 1988 and 2001, a total of 555 AECEs were formed in Cuba, most of them joint ventures; at the end of 2001, 400 remained active.9 The number of dissolved AECEs is 155, approximately 28% of the total constituted. The number of active associations, which had been increasing at an annual average rate of around 28% between 1993 and 1997, rose by just 6% per year between 1998 and 2001. This is not surprising, considering that almost 60% of dissolutions occurred in the last 4 years. However, it should be noted that the number of authorizations steadily declined during the same period. Interestingly, the Cuban Ministry of Foreign Investment (MINVEC) reports that other 72 international economic associations operating in Cuba are in the process of dissolution. Therefore, unless a significant number of new agreements are signed in 2002 (or perhaps most of the contracts of the AECEs subject to dissolution are renewed), it is possible that the total number of active AECEs will begin to decrease for the first time since 1988. Many international economic associations formed in the early 1990s dissolved because of the termination of the contract between the Cuban state and the overseas investor. These were mostly small and medium size AECEs whose profits have been disappointing, in part because of the lack of adequate financing. In fact, although changing priorities of the Cuban authorities toward foreign investment might have played a role in this development, it is not a secret that the Cuban partner in joint ventures is often unable to live up to its payment committments. Other international associations dissolved because of the withdrawal of the foreign partner. The existing restrictions on the operation of enterprises, excessive bureaucratic practices, and failures to achieve the planned results seem to be the most common causes. In spite of the increasing number of dissolutions and the lower rate of authorizations of AECEs, Cuban authorities argue that foreign investment is in a process of consolidation. In February 2002, Minister Marta Lomas stated: “While Cuba is often blamed for trying to slow down foreign investment, what is happening in reality is the opposite. The country has been concentrating on businesses with results.”14 Indeed, many foreign investors are engaging in profitable operations and expanding their interests in the Caribbean island. It is true that some major foreign companies have had problems in 2001 (especially those in the tourist sector such as Spain’s Sol Meliá), but none of them have pulled out of the country. For instance Brazil’s Petrobras, after ending its oil explorations, said the decision was temporary and that it was still interested in prospecting for oil in deep-water areas in the Gulf of Mexico. Not even those companies that have been targeted or sanctioned by the Helms-Burton law of 1996 have divested themselves of their Cuban holdings.15 In short, 400 international economic associations remain active in Cuba and someone must be making money. 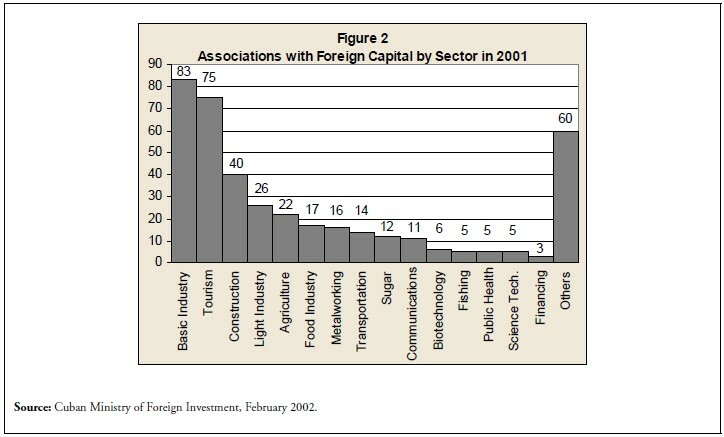 At the end of 2001, the greatest percentage of economic associations with foreign capital was linked to basic industry (mainly mining, oil, and energy), followed by tourism, construction and light industry manufacturing (Figure 2). From previous years, there is a reduction of AECEs in basic industry and, to a lesser extent, in the metalworking and food industries. This supports the aforementioned argument that a number of associations involved in oil and mining exploration contracts have halted their operations recently. On the other hand, joint ventures in tourism, sugar, and communications were on the rise. Developments in the sugar sectors are very important, and will be analyzed in the next section. The Economic Commission for Latin America and the Caribbean (CEPAL) estimates that, since the authorization of the first joint venture in 1988 until 2001, the total amount of committed foreign investment is $5.4 billion, of which around half has already been delivered.17 The latest balance of payments data of the Cuban Central Bank puts accumulated foreign direct investment (delivered FDI) at $1,964 million (Table 1). The 2002 economic report has revised data for 2000 from $399.9 million to $448.1 million, while FDI for the year 2001 is just $38.9 million. 18 The latter is a very disappointing result that comes on top of declines in tourism (gross revenues have decreased for the first time since 1991), exports, and other hard currency revenues such as remittances. Sectors with a significant presence of foreign capital are tourism, energy, oil, mining, telecommunications, and construction. In terms of the number of foreign direct investments, countries of the European Union as a group account for more than 50% of the total (Figure 3). International economic associations with Canadian partners have declined, while those with Chinese and Latin American companies are on the rise. Spain continues to be the main investor in the island (104 joint venture agreements signed), followed by Canada (70), Italy (57), and France (18). • A joint venture (Desarrollo Turístico Bacunayagua S.A) between Cubanacán and the Spanish firm Valle Yumurí S.A. to build a new resort in the province of Matanzas. In December 1999, the Spanish/French company Altadis purchased 50% of the shares of Habanos S.A., the company that markets Cuban tobacco products internationally; foreign investment in this operation has been estimated at around $476 million. If we analyze data on foreign direct investment in 2000 ($448.1 million), we can fairly assume that the agreement with Altadis accounts for most of the inflows. In fact, it is reported that the Spanish-French company paid the Cuban government $439 million in 2000, with the remaining $38 million dependent of Habanos reaching unspecified earning targets in 2001-2004.35 Therefore, in the light of the low amount of FDI reported in 2001, it appears clear that a significant part of the capital pledged in 2000 has not been delivered to the country. In evaluating the performance of FDI in Cuba, it is important to acknowledge that the government has been looking in recent years not only for large investments but also for soft credit (highly concessional loan financing) provided by foreign partners.36 In fact, because of the collapse of the former Soviet Union and the economic pressure of the U.S. embargo against the island, Cuba has had to rely almost exclusively on expensive short-term credit to halt the deep economic recession of the early 1990s. With the exception of China, the attempts of the Cuban government have generated little results so far. In contrast with the low number of authorizations of new AECEs and the meager amount of delivered FDI in 2001, positive aspects should be underlined. First of all, the main indicators of international economic associations have shown a constant progress since the opening to foreign investment in the early 1990s. This development appears to confirm that the Cuban authorities have been concentrating over the years on investments with results. The trends of the main indicators of international economic associations in 2001 were positive. Total sales of AECEs increased by 5% over the previous year and reached $1,834.9 million. Sales in the domestic market ($1,066.7 million) rose by almost 6% and exports generated through AECEs ($768.2) by 4%. Finally, direct income or “ingresos al país” from international economic associations (which refers to the profits of the Cuban partners in AECEs plus revenues from workers’ salaries) peaked at $370.8 million, an increase of 8% from 2000 (Figure 6). The Cuban Ministry of Foreign Investment also reports that net profits of all AECEs grew by 19%. Although most of the agreements signed in 2002 do not involve large amounts of investment (except for some in the tourist sector), it is significant that new foreign companies are entering the Cuban market. Cuba’s increased selectivity toward foreign direct investment and its preference for large projects in recent years do not mean that small and medium businesses have been halted. They are simply being provided for through other mechanisms such as cooperative production agreements, regulated by Cuba’s Executive Committee of the Council of Ministers on December 6, 2000 (Agreement N.3827). As with joint ventures, the government says the objectives of these agreements with foreign partners are to obtain capital, new technology and know-how, substitute imports, and gain access to markets. Furthermore, in addition to the increasing number of management contracts in the tourist sector (promoted since the opening to foreign investment in the early 1990s), Cuban authorities have encouraged administration contracts in industrial sectors with foreign partners. This demonstrates that the search for technology and markets is accompanied by a growing awareness of the value of management expertise. Cooperative production aims to solve three major complaints raised by investors in Cuba, while committing state property in those activities that do not necessitate significant capital for their development. In spite of Law 77, foreign investors keep complaining about the length of negotiations, excessive bureaucratic practices, and expensive dollar payments to Cuban workers recruited by a state-entity (while the government pays them in Cuban pesos).51 As compared to an international economic association, the approval of a cooperative production arrangements is much more simple and faster (between one and three months), and the documentation required is less rigorous. 52 In fact, while the former must be authorized by the Executive Committee of the Council of Ministers or by a government commission designated for that purpose, the latter is simply approved by the Ministry overseeing the Cuban entity. Cooperative production agreements can take many forms. For instance, instead of purchasing equity, a foreign investor can provide capital and sell on credit raw material, technology, and know-how to its Cuban partner in exchange for a fixed sum per product produced (royalty), or buy the finished product outright for export. These agreements are not too different from international economic association contracts regulated by Law 77. The main novelty, however, is that in cooperative productions the work force is paid directly by the government in local currency, and the foreign partner pays no taxes. 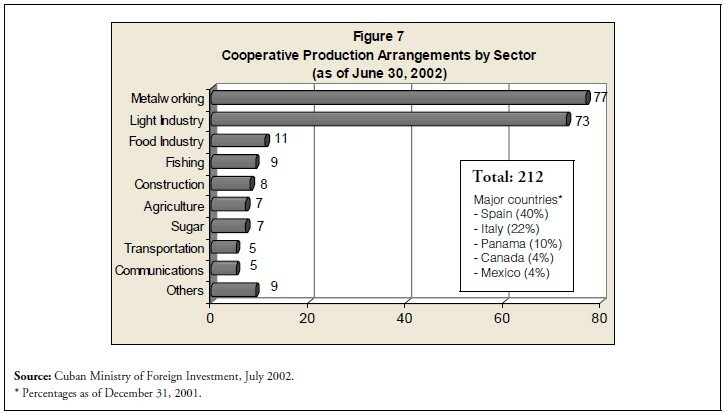 With foreign companies avoiding to pay for labor in dollars, business operations contemplated by these agreements have been characterized by some investors as a sort of “maquila,” in the style of U.S. assembly plants on the Mexican border.53 There is also a possibility that a foreign firm is engaged in both a cooperative production and an administration contract, thus having the control of an enterprise and a share of its revenues. First, it must be remembered that the U.S. 40-year economic embargo against the island, reinforced with the enactment of the Helms-Burton law in 1996, has created a riskier and more uncertain business environment and complicated Cuba’s access to external financing for important sectors of the economy. 61 Second, Cuban authorities make no secret they resorted to foreign investment in the early 1990s out of necessity, and essentially against their will. By their own admission, the country is not moving towards the creation of a market economy and the development of a real and substantial private sector. In August 2000, Carlos Lage said: “The government policy is aimed at establishing a state economy, not one in which transnational companies may arrive and lead to the disappearance of nationally-owned enterprises, and in which foreign capital makes national wealth emigrate toward rich countries. The economy will be regulated so that the benefits of investment go to society.” 62 Third, and more important, the Cuban economy and its business environment present characteristics that are very different from any other country of the region. Therefore, quantitative comparisons with other Latin American countries based on delivered FDI have a limited value. While the role of foreign capital in the Cuban economy is not fundamental, there are some indicators that show it is nevertheless quite important. In the light of these indicators, Cuba’s reiterated claims that overseas investments are a complementary measure for the economic development of the country appear at least questionable. For instance, since 1995 export revenues (goods and services) generated through international economic associations have grown steadily, reaching $768.2 million in 2001. What’s more important, their share in Cuba’s total value of exports of goods and services has also increased (Figure 8). In 2001, AECEs accounted for approximately 16.5% of the country’s total dollar revenues from all sources. If we consider that FDI in Cuba between 1991 and 2000 represented just 8% of the gross fixed capital formation63 (capital created for the production of goods and services), the performance of AECEs appears remarkable. In addition, it must be noted that export revenues generated by AECEs are derived to a great extent from products rather than services. The latter may include the sales of joint ventures in the tourist sector (where dollar revenues are mostly linked to management contracts rather than AECEs) and international telephone calls. Today, exports of goods are certainly less important for the Cuban economy than during the 1980s, but they are still a precious source of hardcurrency for the country. 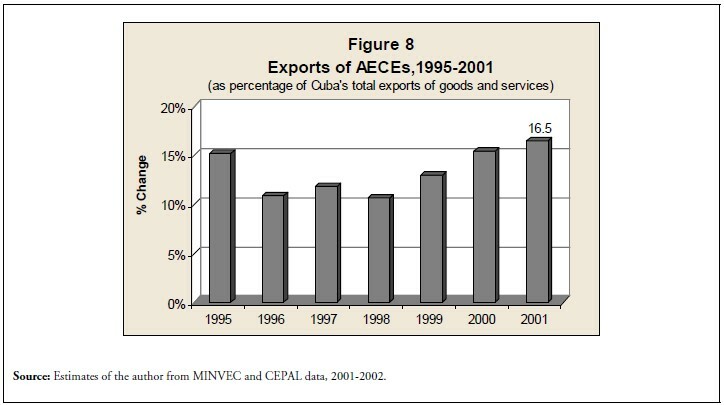 The U.S.-Cuba Trade and Economic Council reports that AECEs accounted for approximately 50% of Cuba’s revenues from all product exports in 2001.64 According to my findings, this percentage seems to be somewhat inflated. Even assuming that all export revenues of AECEs in 2001 are from products, their share would be around 46%.65 At any rate, we can fairly say that foreign participation plays a significant role in the country’s total export earnings from goods. Moreover, if we add exports from free trade zone ($26.3 million in 2001) and especially those generated through cooperative production agreements, the importance of foreign investment is even more pronounced. 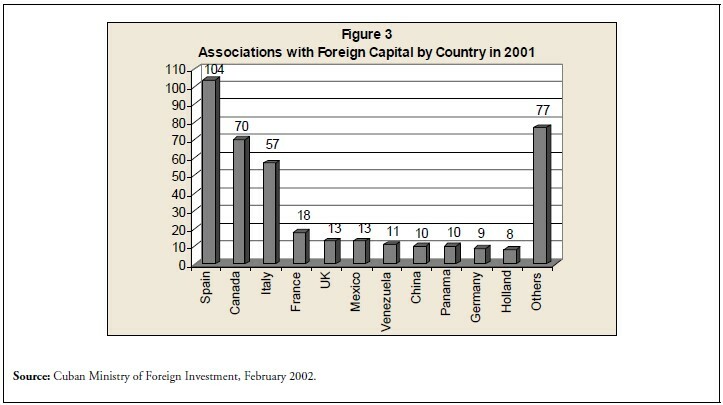 Since 1997, the importance of foreign capital has grown even more. In the oil sector, Cuban authorities announced that, as of December 2000, foreign companies had invested a total of $446.6 million.67 Crude oil extracted through exploration activities with overseas firms (along with the introduction of top level technologies) has enabled the Cuban government to increase domestic production of electricity and natural gas. For instance, the Energas plant constructed with the Canadian company Sherritt in 2000 (cost of the project around $150 million) uses the natural gas released during oil extraction for producing electricity. In 2001, more than 70% of the country’s electricity was generated with domestic fuel. 68 It is reported that total foreign investment in nickel amounts to over $400 million, supporting production increases from 26,900 tons in 1994 to 76,500 tons in 2001. Just one plant (Pedro Soto Alba), operated through a joint venture between Cuba’s General Nickel Co. S.A. and Canada’s Sherritt International, produced a record 32,360 tons in 2001 (42% of the total production).69 In the cement sector, FDI has taken a prominent role thanks to the involvement of Spain’s Inversiones Ibersuizas and Swiss-based Holderbank. In tourism, 26 joint ventures in the hotel industry had 15,600 rooms under development and 3,700 in operation in 2000, just 11% of the 35,000 available rooms in Cuba. However, there were 17,000 rooms under management contracts with foreign firms that represented around 48% of the total.70 Finally, with new agreements such as those of Compañía Azucarera, Altadis, and Pescanova (see above), foreign participation has a substantial influence over the production and marketing for the five largest export sectors (in terms of gross U.S. dollar revenues) such as sugar, nickel, tobacco, rum, and fishing.71 According to the Cuban Central Bank, these sectors accounted in 2001 for more than 32% of Cuba’s total dollar revenues from all sources. Foreign investment has not only helped Cuba to find new markets for its main products but also increased the competitiveness of Cuban production and, therefore, the contribution of import substitution to overall economic expansion. If we analyze the evolution of the sales of international economic associations since 1995, we can see that the share of exports has been decreasing whereas the domestic market has gained importance (Figure 9). While in 1995 exports represented approximately two-thirds of the sales of AECEs, in 2001 they have dropped to around 42%. 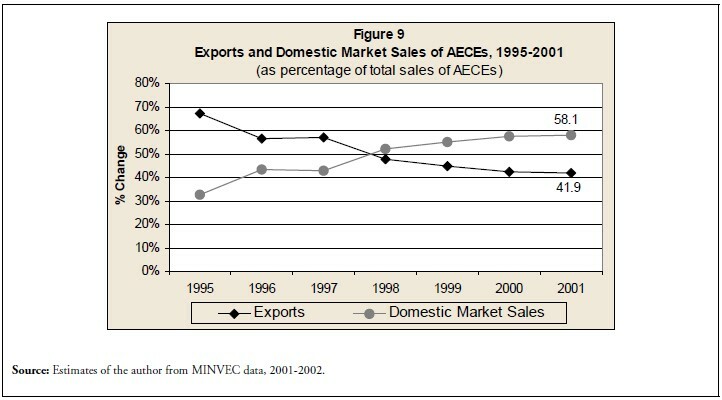 Meanwhile domestic market sales have grown steadily, accounting for about 58% of total AECE sales in 2001. Of course, we are left without knowing the composition of these sales and their impact on import substitution. However, if in the last two years international economic associations have sold in the domestic market goods and services worth more than $2 billion ($1008.9 million in 2000 and $1066.7 million in 2001), it is conceivable that such an impact has not been negligible. This section has provided some evidence for the role played by foreign capital in the Cuban economy. However, while having a significant impact on total exports as well as on supplies to the tourist industry and dollar stores, foreign investment cannot be objectively considered as the most important factor for the economic development of the country. For instance, since the legalization of dollar holdings in 1993, the domestic dollar market has expanded rapidly on account of growing remittances (estimated at about $720 million in 2000 by CEPAL). Between 1994 and 2000, sales in Cuba’s dollar stores have increased from $200 million to $1.25 billion.75 In the light of this development, several scholars contend that remittances have been the single most important factor in reactivating the Cuban economy in the second half of the 1990s. From the analysis presented in this paper, we can conclude that recent results of foreign investment in Cuba have been mixed. Although Cuban authorities argue that the opening to foreign capital is somewhat consolidating, recent trends on authorized international economic associations and the flow of delivered FDI to the country are worrisome. The number of new economic associations with overseas partners has been decreasing, while the amount of foreign capital delivered plummeted in 2001. Even more important, a significant amount of capital pledged by foreign companies in the last two years has not been delivered yet, perhaps reflecting the growing complaints among investors for the existing restrictions on the operation of enterprises. However, there are some positive aspects that should be underlined. The number of international economic associations has shown steady growth since the opening to foreign investment in the early 1990s, thus supporting Cuba’s claims that the government has been successful in attracting foreign investment. In 2001, exports and domestic market sales of international associations increased from the previous year. Moreover, in spite of the critical international context created by September 11 (with negative effects on tourism and remittances from abroad) and the extensive damages caused by hurricane Michelle in November 2001, there is still interest among foreign firms to engage in business activities on the island. Tourism still offers some of the brightest investment opportunities in Cuba, as demonstrated by several agreements signed in 2001 and during the first half of 2002. Cuban authorities are also giving priority to investments in energy, oil, and sugar byproducts. The main novelty of 2001 was the approval of joint ventures in raw sugar production and refining, as part of a wide process of restructuring of the sugar industry. A major contention of this study is that foreign investment plays an important role in the Cuban economy, certainly more than Castro’s government is willing to admit. Foreign investment has helped Cuba find new markets for its main products, increased the competitiveness of Cuban production, and stimulated import substitution. Overseas companies have a substantial influence over the production and marketing of Cuba’s most important export sectors. Additionally, international economic associations and new forms of investment such as cooperative production agreements have boosted domestic supply to the tourist industry and to the increasingly important internal market in hard currency. 1. This paper is mostly based on field research conducted in Cuba during the summer of 2002. The Department of Food and Resource Economics at the University of Florida supported the field research trip and the preparation of this paper. The author alone is responsible for the content and interpretations. 2. Pérez Villanueva, Omar Everleny. El Papel de la Inversion Extranjera Directa en las Economias Subdesarrolladas. El Caso Cubano. Ph.D. Dissertation, Universidad de la Habana (1998), p. 98. 3. The Economist Intelligence Unit (EIU). “External shocks squeeze growth.” Country Briefing (June 18, 2002). 4. The term international economic association (or simply economic association) refers to the following: joint activities by one or more national investors and one or more foreign investors for the production of goods, the offering of services, or both, for profit, either as joint ventures or international economic-associations contracts. Joint ventures have a legal status distinct from that of any one of either of the parties; the proportions of capital stock which should be contributed by the foreign investor and the national investor are agreed upon by both partners and defined as part of the authorization. International economic association contracts do not imply a legal entity separate from those of the contracting parties; each contracting party makes its own contribution and maintains control over it. 5. Confidential Report for the Embassy of Japan in Havana. “Investment Opportunities in Cuba.” Unpublished (March 31, 1999), p.10. 6. Pérez-López, Jorge F. “Foreign Investment in Cuba in the Second Half of the 1990s.” Paper presented at International Symposium organized by Carleton University and the University of Havana, September 28-30, 1999. 7. U.S.-Cuba Trade and Economic Council, “Foreign Investment Policy Change.” Economic Eye on Cuba (February 16, 1998 to February 22, 1998). http://www.cubatrade.org/eyeonr.html#4. 8. EIU. “Foreign investment focuses on large projects.” Country Briefing (February 12, 2001). 9. In July 2002, Cuba’s Vice-Minister of Foreign Investment Ernesto Sentí reported that the number of active international associations in Cuba had reached 412. See AP. “Prometen facilitar inversiones” (July 18, 2002). 10. The percentage is calculated from EIU data. See EIU. “Foreign partners report output growth.” Cuba Country Report (May 1, 2002). 11. Confidential Report (1999), pp.40-41. 12. Interview with news correspondent stationed in Havana (July 3, 2002). 13. “Poor Prices, Exploration Results Cause Demise of Joutel Resources.” Cuba News, 7:1 (January 1999). 14. Economics Press Service. “Inversión Extranjera. Menos de lo esperado, pero…” (February 15, 2002). 15. The law is the U.S. latest package of economic sanctions against the communist island. It aims to complicate Cuba’s opening to foreign investment by targeting those foreign companies that “traffic” in American properties expropriated during the early days of the revolution. For further details see: Spadoni, Paolo. “The Impact of the Helms-Burton Legislation on Foreign Investment in Cuba.” In Cuba in Transition—Volume 11 (Washington: Association for the Study of the Cuban Economy, 2001), pp.18-36. 16. Confidential Report (1999), pp.3-4. 17. CEPAL. “Cuba: Evolución Económica Durante 2001” (June 6, 2002), p.5. 18. The value of delivered FDI for 2001 has generated controversy because it contradicts previous figures announced by governmental sources. In fact, in December 2001 it was reported that FDI amounted to an estimated $200 million. See Triana Cordoví, Juan. “La Economía Cubana en el 2001, una Perspectiva Global.” La Habana, Centro de Estudios de la Economía Cubana (April 2002), p.14. Also see EIU. 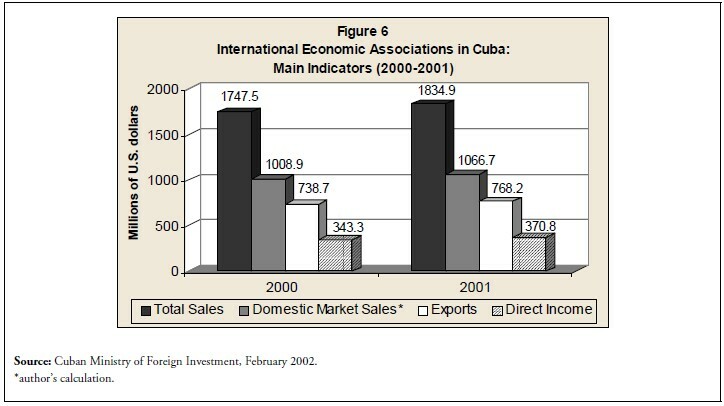 “Data given on trade & investment partners.” Country Report Cuba (February 11, 2002). 20. Interview with news correspondent stationed in Havana (July 3, 2002). 21. It is reported that a total of 72 international economic associations operated abroad at the end of 2001, mainly in construction, biotechnology and pharmaceutical. See EIU. Country Report on Cuba (February 11, 2002). 22. “Millions in Cuban Hotels,” Prensa Latina (May 28, 2001). 23. Interestingly, the Cuban group Habaguanex S.A. and the state-run Chinese firm Construction and Engineering Corporation (CSGEG) had signed a joint venture in 2000 for the construction of a hotel in Havana’s sea-front Malecón. The operation was halted in 2001 without explanation from the Cuban authorities. Unofficial Cuban sources argue that several projects presented by the Chinese company failed to meet the architectural standards required by the Cuban government for new hotels in the colonial district known as “Old Havana.” Interview with an economist of the Centro de Estudios de la Economía Cubana, Havana (June 11, 2002). However, given the good status of the relationship between Havana and Beijing and the increasing financing provided by the latter to Cuba in recent years, it is conceivable that the Cuban authorities simply gave China a better deal. The hotel in the tourist area Marina Hemingway is a bigger and more important project. Interview with news correspondent posted in Havana, June 13, 2002. 25. “Constitution of the mixed company Santa Lucia S.A.” Granma Internacional (November 7, 2001). 26. Eaton, Tracey. “Sweet sorrows for Cuba restructuring of sugar industry leaves workers with a bitter taste.” The Dallas Morning News (July 9, 2002). 27. Oramas, Joaquín. “Alternatives in the sugar industry.” Granma Internacional (July 4, 2002). 28. Although Cuba generally does not reveal joint venture partners (citing the four-decade old U.S. embargo and the more recent Helms-Burton law), business and diplomatic sources in Havana said that Paris-registered Pacol, S.A., a firm connected to the British sugar trader E.D. & F Man, is behind the deal. Frank, Mark. “New Cuban sugar exporter has mystery partner.” Reuters, March 7, 2002. 29. “Creadas en Cuba dos importantes compañías azucareras,” Opciones (June 20, 2002). 30. “Cuba promueve inversiones extranjeras en industria azucarera,” EFE (July 21, 2001). 31. “Foreign investment in Cuba plummeted to $38.9 million in 2001 from $488 million the year before,” Reuters. (July 8, 2002). 32. Construction of new hotels can take up to 2-3 years to be completed. Therefore, foreign capital pledged in 2001 might begin to be delivered in 2002. 33. “Inversión Extranjera: ¿Opción Válida?” Economics Press Service (March 31, 2001). 34. Vicent, Mauricio. “Los tropezones Cubanos del capital extranjero.” El País (July 24, 2000). 35. EIU. “Foreign investment flows remain opaque.” Country Report Cuba (May 4, 2001). 36. An interesting formula to obtain soft credit that might set a precedent for future agreements is the one used by the Cuban government with the Brazilian company Souza Cruz. In April 1995, the latter signed a joint venture (BrasCuba S.A.) with Cuba’s Unión del Tabaco. With an initial investment of $7 million, BrasCuba renovated an existing cigarette factory in Havana and started producing and selling several brands of cigarettes for the domestic market as well as for external markets. For about four years, brands produced by BrasCuba (Hollywood, Popular, Monterrey, and Vegas) competed in the domestic dollar market with other wholly-owned government brands such as Partagás and Montecristo. In 1999, the authorities of the island renegotiated the agreement with Souza Cruz. The government withdrew from the dollar market its own brands and practically gave BrasCuba the monopoly of cigarettes in dollar stores and for exports (a new brand, Romeo y Julieta, was launched early that year). In exchange, Souza Cruz granted a soft credit to the government for the construction of a big cigarette factory in Holguin. The latter produces a new brand of cigarettes (Criollo) for the domestic market in local currency and has announced the introduction of three other brands such as Titanes, Aroma, and Flor de Aroma. Interview with news correspondent stationed in Havana, July 3, 2002. 37. Cuban official sources (MINVEC) report that, through projects of cooperation at the governmental level, Cuba received a total of $14.6 million in soft credit in 2001, of which $8.4 million are from Spain (Basque region) and $6 million from China. In addition, Cuba received a total of $82.6 million in donations, mostly from Spain ($21.1 million), European Union ($12.9 million), United States ($9.2 million), and Italy ($6.4 million). 38. “China to lend Cuba $400 million,” BBC News (April 13, 2001). See also EIU, “China promises financing,” Country Report Cuba (May 4, 2001). 39. Frank, Mark. “Cuba optimista sobre sus posibilidades petroleras,” Reuters (October 24, 2001). 42. Like other investors, Leisure Canada has explicitly stated that its aim is to meet demand from U.S. visitors once the current travel ban is lifted. EIU. “Hotel investments keep coming.” Country Report Cuba (August 1, 2002). 43. Pasic, Djenita. “Early bird gets Cuban cash?” International Communiqué (Spring 2002). 44. “Empresa mixta cubano-española apuesta por producir vinos en Cuba,” EFE (June 8, 2002). 45. “CAPSA suscribe con gobierno cubano creación empresa lactea mixta,” EFE (March 1, 2002). 46. “Chilean-Cuban joint food-processing venture expands,” CubaNews (March 2002). 47. EIU. “Beer joint venture to expand production.” Country Report Cuba (May 1, 2002). 48. ATD 3000. “Pescanova invertirá 33 millones en Cuba.” (May 3, 2002). 50. EIU. “Outlook for 2002-03: External Sector.” Country Report Cuba (September 12, 2002). 51. Cuba’s labor code for AECEs has been denounced by several international labor organizations. Criticism mainly focuses on the system of payment of Cuban workers hired by foreign companies along with discriminatory practices of recruitment due to patronage, cronyism, and conformity of workers’ ideas and behavior to official ideology. The issue has gained importance since the opening to foreign investment in early 1990s and especially after the 1993 legalization of hard currency holdings and the expansion of state-owned dollar stores previously reserved for foreigners. Cuban workers in AECEs receive their wages in domestic currency at the official exchange rate of 1 peso per dollar. However, due to generalized shortages of goods available through the normal distribution system, they are increasingly compelled to buy dollars at the unofficial exchange rate (which is currently 26 pesos per dollar) in order to purchase the products they need in stores that deal only with foreign currency. In this regard, two Cuban exile groups (the Cuban Committee for Human Rights and the Independent Federation of Electric, Gas, and Water Plants of Cuba) filed a lawsuit in 1999 against 40 foreign companies accusing them to be part of an illegal scheme by the Cuban government to deprive Cuban workers of most of their salary. According to the lawsuit, foreign companies pay their workers up to $450 dollar a month each. However, the employment agency pays the same workers an equivalent of $5 dollar a month, while the government keeps the rest. See Morton, Peter. “Two Canadian companies in Cuba lawsuit,” The National Post (June 29,1999). Cuban authorities defend their labor code and justify the high charge made to foreigners by claiming that: 1) direct dollar payments by foreign companies to their workers would create too much difference between the latter and the rest of the Cuban work force; 2) direct payments in domestic currency by foreign companies should also include the cost of benefits for medical assistance, education, and housing that is instead assumed by the Cuban government; 3) it is fair for foreign companies to pay their workers more than in other emerging markets because Cuban workers are more efficient and qualified. Interview with economist of Instituto Nacional de Investigaciones Económicas, Havana (June 7, 2001); interview with economist of Centro de Estudios de la Economía Cubana, Havana (June 7, 2001). 52. The MINVEC reports that the average time of negotiations for AECE in 2001 has been 10.8 months, as compared to 11.1 months in 2000. However, this is still longer than elsewhere in Latin America. 53. Frank, Mark. “Cuba adopts two-track foreign investment policy,” Reuters (August 26, 2001). 54. See U.S. Cuba Trade and Economic Council. “Dairy Joint Venture with CAPSA of Spain expects revenues of US$4.7 million in 2002/2003.” Economic Eye on Cuba (April 1-7, 2002). 55. Pagés, Raisa. “Light Industry. Not just conquering markets, but maintaining them,” Granma Internacional (July 13, 2001). 56. For instance, as part of the program of restructuring of the sugar industry, Cuba signed two new cooperative production agreements in June 2002. The Spanish company Compañia Elaboradora de Caucho (COECA) will provide technological assistance for the installation of a new plant that produces rubber parts for the sugar and agricultural industries. See “Una empresa española aportará a Cuba tecnologia punta para la fabricación de piezas de caucho,” Europa Press (June 20, 2002). Another Spanish firm, Dilsa, will supply automotive equipment to the Cuban company TransMinaz to renew technology related to transportation and to save fuel in the sugar industry. See “Empresas de Cuba y España colaborarán en sector del azúcar,” EFE (June 22, 2002). 57. According to figures released by MINVEC in April 2002, the total number of cooperative production arrangements at the end of 2001 was 198. Spain was the most active investor with 79 agreements signed, followed by Italy (43), Panama (20), Canada (9), and Mexico (8). 58. EIU. “Outlook for 2002-03: External Sector.” Country Report Cuba (September 12, 2002). 59. For instance, María Werlau argues that the flow of FDI into Cuba in the last decade has been very disappointing both in overall cumulative terms as well as in comparison with other countries. She adds that FDI in Cuba today remains little more than an instrument of economic survival, subservient to the imperatives of maintaining political control. See Werlau, María. “A Commentary on Foreign Investment in Cuba.” In Cuba in Transition—Volume 11 (Washington: Association for the Study of the Cuban Economy, 2001), pp. 290-292. 60. Pérez Villanueva, Omar Everleny. Estabilidad Macroeconómica y Financiamento Externo: La Inversión Extranjera Directa en Cuba. Havana: Centro de Estudios de la Economía Cubana (CEEC), April 2000, pp.25-26. 61. Spadoni, “The Impact of the Helms-Burton Legislation on Investment in Cuba,” p. 30. 62. “No official market economy for Cuba,” Caribbean and Central America Report (August 22, 2000). 63. Pérez Villanueva, Omar Everleny. “La Inversión Extranjera Directa en Cuba: Evolución y Perspectivas.” In Cuba. Reflexiones Sobre su Economía. Universidad de La Habana (2002), p.73. 64. U.S.-Cuba Trade and Economic Council. “Five largest U.S. dollar export revenue sectors have foreign participation.” Economic Eye on Cuba (April 1-7, 2002). 65. The percentage is calculated from the latest data of the Cuban Central Bank, according to which Cuba’s total earnings from product exports in 2001 was $1,661.5 million. 66. Pérez Villanueva, Omar Everleny. La Inversión Extranjera Directa en Cuba. Peculiaridades. La Habana: Centro de Estudios de la Economía Cubana (March 1999), p.119. 67. See “El efecto del bloqueo solo en los ingresos azucareros ascienden a mas de $6400 miliones.” Informe de Cuba al Secretario General de la ONU. Granma Internacional (July 21, 2001). 68. Molina, Gabriel. “Island to produce 90% of its own electricity by year’s end.” Granma Internacional (April 27, 2001). 69. “Sherritt reports mixed results,” CubaNews. (March 2002). 70. Figueras Pérez, Miguel Alejandro. “El Turismo Internacional y la Formación de Clusters Productivos en la Economía Cubana.” In Cuba. Reflexiones Sobre su Economía. Universidad de La Habana (2002), p.109. 71. U.S.-Cuba Trade and Economic Council, “Five largest dollar export revenue sectors have foreign participation” (2002). 72. Pérez Villanueva, Omar Everleny. “La Inversión Extranjera Directa en Cuba,” (2002), p.86. 73. Figueras Pérez, Miguel Alejandro. “El turismo internacional y la formación de clusters productivos,” (2002), p. 112. 74. Domestically produced sales in dollar stores in 2000 have been estimated at $600 million. See EIU. “Hard currency sales boost light industry.” Country Report Cuba (February 1, 2001). 75. See Conas. Cuba: Inversiones y Negocios. La Habana (April 2000), p.33. Also see EIU, “Hard currency sales boost light industry” (2001). 76. Monreal, Pedro. “Las Remesas Familiares en la Economía Cubana.” Encuentro de la Cultura Cubana, 14 (Otoño de 1999), p. 50. 78. Declaration of Carlos Lage on Cuban National Television (Noticiero Nacional de la Television Cubana) (March 18, 2001). 79. “Cuba: economía y turismo,” Economics Press Service, No. 10 (May 31, 2001).